- Karelia. Edge of woods, boundless lakes, Peter the Great places (that is where the fleet was passed over the land). Karelia is full of giftings and challenges. I got here 14 years ago, and still I cannot forget this place. I hope that several photos can show all the beauty of our northern scandinavia, and I cannot imagine myself without it anymore, I think. ENTER the gallery. - Poodles photoalbum. 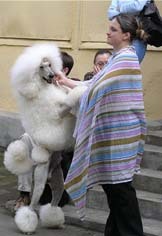 Here I will place pics of our poodles, those which cannot be placed in the personal poodles' pages. And also, poodle people asks for pics of, for example Elvis, although he lives with his owner, he still is my "son", and Ii think it is OK to place his pics here. Also from the shows there are always some pics of poodles other than mine, so this place will be so called "attic" with interesting findings. ENTER the gallery. - Our Pamirka. When we decided that we will live in the countryside, immediately a question came about the security dog. We were choosing between Kaukaz and Sentral Asian Ovcharka. In our case Central Asian was the winner. I never thought that such a dog can have such a head - full of wisdom. 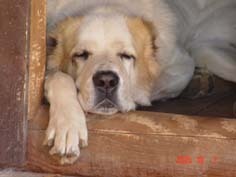 This breed exists already for 4000 years, and the selection was made on the working qualities and "brains" My brother in law told me that in Turkmenia (Central Asia) the shepherd says smth to his dog - Asiat, and this dog stands and goes to gether the sheeps and brings them to the needed place, then he comes back and lays near the fire. that is . Such a clever boy is our Pamir. (only in sense of cleverness, we do not keep sheeps :))). He is our watchman and defender. ENTER the gallery.